All the Cape Cod Mermaids got together to make this whimsical print. Who knew so many would turn up? 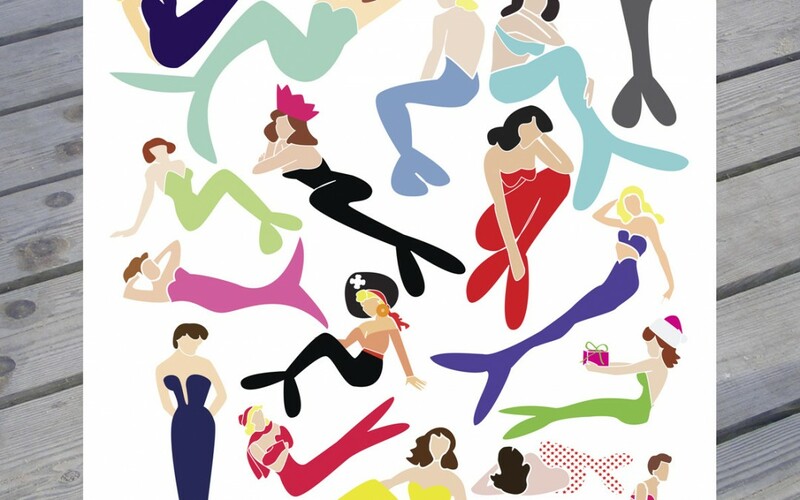 Mermaids on Display Poster features 21 sassy mermaids done in a digital white line print format. It is the perfect gift for Mermaid Lovers and will brighten any corner of the house. This print will be adored by swimmers and beach lovers. Perfect for a Beach Cottage, Coastal Living or Cape Cod home. This high color digital print is 11″ x 17″ printed on a 13″ x 19″ Epson Matte Paper. The print will be shipped in a cardboard shipping tube. The print fits nicely in an over the counter 18″ by 24″ frame with a 3 1/2″ Mat. The combination of Epson ink and Epson premium matte paper will last 100 years if not place in the sun. The Mermaids are dressed for all seasons and holidays and their friends the Lobsters are joining in the fun. The hand drawn appearance of the font used for Mermaid continues the playful feel of this print.